Barcelona Photoblog: Tapa or Pintxo? What's in a Name? Tapa or Pintxo? What's in a Name? Allow me to use two words to refer to this small serving. As I mentioned in a previous post according to the region you are visiting in this multicultural concoction known by many as Spain, you would call this slice of bread holding a given combination of ingredients, either tapa or pincho. If it carries a toothpick it is certainly a pincho but either way it is a kind of tapa. According to the Real Academia de la Lengua dictionary a Pincho is a small portion of food taken as an appetizer sometimes pierced with a toothpick while Tapa is a small portion of food served as an accompaniment to a drink. Considering such "subtle" difference, a tapa refers to anything small you have while you drink and a pincho does not imply a drink (hard to believe!) and may carry a stick on it (sometimes!). You see, our dictionary does not help much. Well, a pincho or pintxo has to do more with Northern Spain (the Basque country, Navarre, Cantabria, etc) although you may find they call it so in other regions as well. The way I see it, tapa is a more general term that may include larger portions, whether pierced by a toothpick or not but you know what? 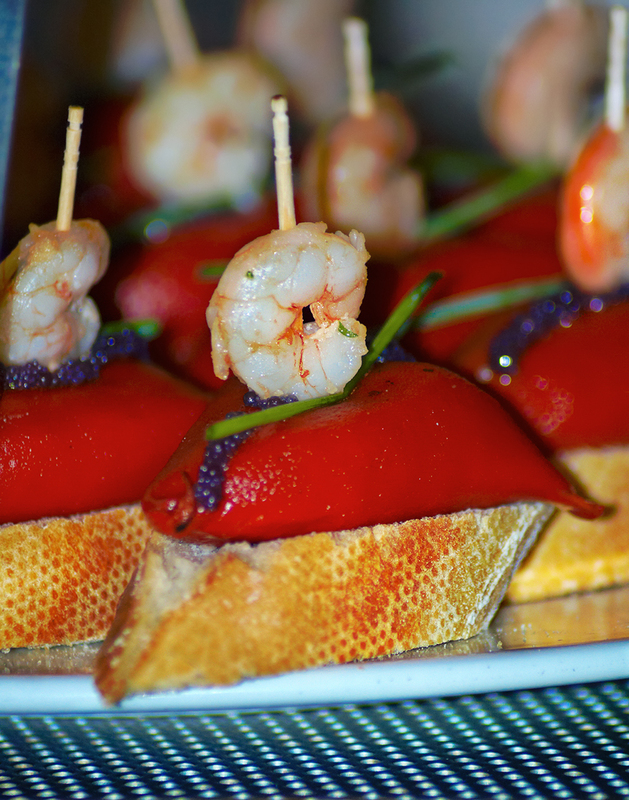 some pintxos are served on a roll or with no bread at all and even without the toothpick! So there we go again! As you know language is alive and a dictionary just tries to make rules out of common usage. In real life concepts are not that strict. Don't be surprised when you find it hard to decide upon one word or the other and you hear "give me a tapa of jamón" and "a pincho de tortilla". We went to this Basque restaurant, called Sagardi, where I had a reasonable amount of pintxos like one of these of shrimp and red pepper. In Barcelona pintxos are never as good as in San Sebastian, Bilbao et al. We are aware of that but we look the other way. Most clients already know how a pintxo should look and taste, cause they have been up North and have had a great time there, hopping from place to place in renown streets full of pintxo bars. But we accept the fact, pay more and dream about our next trip to the land of pintxos. Those of you who never tried them before are surely missing one of the greatest culinary experiences you can think of not just because of the quality of the product and the way it is presented but also because of the ritual behind it, the social aspect of going for and sharing around pintxos. As I said, Barcelona is not the perfect place for what is known strictly as pintxos. We have a whole bunch of extraordinary tapas bars but for us going for pintxos is not a way of life if you know what I mean. In the Basque country there are annual competitions of pintxo bars, everyone wants to serve the best pintxo cause positive word-of-mouth communication really makes the difference. Good pintxo fans travel together in groups and have a route of their own with an expert eye for the best choice so guess how important it is to have a good reputation and deliver quality service. How it works? : Ask the waiter for an empty dish and order your drink of course (I prefer cider or sometimes a glass of txakoli which is a young white wine) and then start "fighting" with other clients in your quest for the best pintxos properly displayed in comfortable self service lid covered glass shelves or conveniently distributed all over the counter and constantly refurbished with an extraordinary amount of possible combinations of food. Take as many as you wish but never throw the toothpick. You ought to keep those on your dish so you can tell the waiter how many pintxos you had when you ask for the bill. If you want to know more and choose your own route or find the best tapa/pintxo try: Todo Pintxos. Yammy, looks very delicious! Very nice picture. I have to agree with Petru above. This is one of the most interesting posts I have read in your blog. Totally fascinating! I have presented you with an award on my blog. It is a gift to show my appreciation of your photos and words. Keep up the good work. madre mía! vaya primer plano!! vivan las tapas! vivan los pintxos! Un saludo efusivo compa, hata pronto! Me hiciste recordar el pan tomaca, las patatas bravas, la tortilla y demás cosas buenas que tiene España! Love you blog and pics! Keep up the lovely work! how about the word 'salivate' to jostle in with tapas and pincho? Delicious photo - I want to try one! Fantastic photos on your blog. I feel like I'm back in Barcelona again.